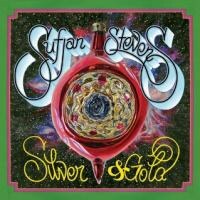 Silver & Gold is a great present unto itself, and there’s certainly enough here to make the Sufjan completist giddy with glee. Sufjan Stevens seems to be depressed about the upcoming Yuletide season. There are numerous signs. For one, the promo photo that accompanies Stevens’ new collection of Christmas songs, Silver & Gold: Songs for Christmas – Volumes Six-10, shows the indie rock-folk-electronica musician looking dour as someone dressed up as Captain America showers him with confetti. His Christmas tour is being dubbed either the "Surfjohn [sic] Stevens Christmas Sing-A-Long: Seasonal Affective Disorder Yuletide Disaster Pageant on Ice" (according to Pitchfork) or the similarly tongue-in-cheek "The Sirfjam [sic] Stephanapolous [sic, sic, sic] Christmas Sing-A-Long Seasonal Affective Disorder Spectacular Music Pageant Variety Show Disaster" (according to Wikipedia). A number of Sufjan originals on Silver & Gold (and there’s a fair pile of them this time around: I counted 22 that he authored or co-authored, in fact, out of a grand total of 58 tracks that sprawl across roughly three hours) have morbid titles: "Eternal Happiness or Woe", "Even the Earth Will Perish and the Universe Give Way", and "Justice Delivers Its Death". Then there are the goodies within this box set that underscores Stevens’ feelings of Ho Ho Ho-Hum. The black and white poster in the collection features a skeleton riding a cat, among other things. One of the stickers that are included in the box is of another skeleton (the Grim Reaper?) dressed up as Santa, who is wielding a bloody axe. What’s more, even at least one of the other promotional materials that accompany these five EPs (if you can call them that, for at least one of them graces the 42-minute mark and another is 46 minutes long) are a little, well, violent. The fun claymation video for "Mr. Frosty Man" has a snowman brandishing a chainsaw a la Ash from the Evil Dead series and shotgun, taking on a horde of zombies, of which Santa Claus becomes one. And then there are Steven’s own liner notes that accompany the album. "By now, it’s no mystery that Christmas has become an incalculable commodity in our material world -- an annual exploitation of wealth, a festival of consumerism, and a vast playing field for the voyages of capitalism -- casting a dark pall on many of the season’s sacred modifiers: the poverty of the Holy Family or the philanthropy of St. Nicholas, for example," Stevens sighs. The booklet also features an essay from a pastor that concludes with the portending lines, "Advent is ultimately about death. The end is near. You are going to die. Happy Holidays." Oh, and one more thing: the final song on this set called "Christmas Unicorn" -- which is, I suppose, what you’d get if the Irish Rovers got hopped up on eggnog -- even borrows a bit of melody and lyrics from, get this, Joy Division’s downtrodden "Love Will Tear Us Apart". Clearly, Sufjan Stevens is having something of a Blue Christmas. However, whatever Sufjan Stevens’ feelings are about Christmas this year, you have to admit that he’s being a bit charitable. Except for the songs he co-wrote with Aaron and Bryce Dessner of the National on the first disc that graces this collection, Stevens has thrown all of the songs that he individually authored here into the public domain. The massive booklet of liner notes and lyrics also contains tablature, for the everyday musician to learn and play these gifts of good (or is that sometimes depressive?) tidings and cheer. "These songs are your songs," says Stevens in the liner notes. "You are free to perform them, record them, exploit them, enjoy them (or ignore them) however you desire." While this may smack as being self-important to some, that Stevens just wants to put his music on the same pedestal of the classic carols that are covered on Silver & Gold, you do have to admit that it is a nice gesture -- one that may make some of these songs the kind of thing that carolers can use with impunity throughout the Christmas seasons to come. And it may very well be that some of these songs will eventually become seasonal classics. However, and more to the point, what Silver & Gold’s real utility is, whether it is intentional or not, is to show the Sufjan Stevens of Christmases past, present and future: the trajectory of his leanings as a folksy musician, to his dabblings in squelchy electro-beats and robo-voices, to a middle ground that incorporates a little bit of both sides of the fence. And, yes, Silver & Gold has the odd dalliance that extends beyond Christmas: there’s a version here of the New Year’s Eve standard "Auld Lang Syne", and Stevens reaches out well into the secular and non-traditional by including a cover of Prince’s "Alphabet St.", which is a bit of a head-scratcher to be sure. So, yes, there is plenty, plenty to enjoy here on a snowy, wintery afternoon, as there’s a lot of Christmas and slightly not-so-much to be found within Silver & Gold, recorded between 2006 and 2010, with some touch-up doing in the intervening years, and I suspect that many fans will have their own personal favourite disc out of the five. Mine is actually the very first one: 2006’s Gloria. Recorded and co-authored in part with the Dessner brothers, Gloria sees Sufjan Stevens at his most traditional. The year was a busy one for Stevens, Christmas-wise, as 2006 was already represented in Stevens’ other collection of holiday songs, Songs for Christmas, spanning the years 2001 to 2006. However, Stevens sounds far from tired, as there is a certain vigor to these songs, and two of them -- "Carol of St. Benjamin the Bearded One" and "Barcarola (You Must Be a Christmas Tree)" -- came close to making this reviewer tear up because they sound so lovely and a bit melancholic. The apple doesn’t fall far from the Illinois tree, and it’s refreshing to hear this tender side of Stevens songwriting abilities bear fruit. We may never hear this side of Stevens again, based on the path his songwriting took from this point forward, so it’s great to be reminded about how moving his songs could very well be. However, the most intriguing collection of songs comes with Vol. Seven: I Am Santa’s Helper. With 23 tracks spanning more than 42 minutes, this set comes across as Sufjan Stevens’ idea of how a Guided by Voices Christmas album would sound like, with many of the songs being fragmentary and clipping by usually at just a minute in length. Some of the song titles even have a certain Robert Pollard touch to them: "Christmas Woman", "Mysteries of the Christmas Mist", "Ding-a-Ling-a-Ring-a-Ling", "Mr. Frosty Man" and "I am Santa’s Helper", the last one boasting the morbid line "I am Santa’s Helper / You are Santa’s slave". The disc is interesting in that it is almost a harkening back to Stevens’ debut, 2000’s A Sun Came with its slightly psychedelic touches, particularly on "Christmas Woman", with shimmery sitar-like guitars that feel as though they were pulled from the Byrds’ classic "Eight Miles High". However, the music on this disc also sounds the most carol-like, with Stevens surrounded by a bevy of choir voices. His rendition of "Jingle Bells", in fact, boasts the joyous sounds of a small child laughing. Some may be put off by the seemingly tossed-off nature of the songs, but I Am Santa’s Helper is, by far, the EP to be found here that offers most rewards on repeated listens, given the broken-down nature of the songs, creating a sort of knottiness that one can get lost in. Alas, the most disappointing disc comes next with Christmas Voyage. Recorded around the same time that Stevens was moving into electronic territory in 2008 with his experiments into the realm of drum machines, garish synths and Auto-Tuned vocals with 2010’s The Age of Adz (though the liner notes indicate that some of the material was redone in 2011 and 2012 due to the fact that the set had been uploaded to the Internet, so some of the fixing may have come after this initial recording period), the main problem is that some of these songs simply pummel the listener: they are quite overlong and punishing with their spirit of abandon. Sufjan’s electro-take on "Do You Hear What I Hear?" goes on for more than nine intolerable minutes, while his original "The Child with the Star on His Head", which actually starts out quite affectingly with its piano line and laid-back countrified guitars, turns into a big pile of white noise and effects somewhere around the 10-minute mark, and continues on for another time-stopping five minutes. However, for all of this EP’s failings, there’s a brilliant Christmas original with "Christmas in the Room", which, too, sees Stevens leaning towards his more traditional folksy side, and sounds like it might have snuggled quite effectively onto the All Delighted People EP. From there, Stevens settles down into an amalgam of his electronic leanings and finger-picking original sound with the set’s final two EPs: Let it Snow! and Christmas Unicorn. On the former, Stevens moves into dop-wop territory with his reading of "I’ll Be Home for Christmas", though perhaps the most noticeable thing about the short album is that it features Stevens’ takes on the Christmas-y work of other contemporary artists. "The Sleigh in the Moon" is a haunting number written and sung by former Sufjan band member Cat Marino, and the very, very short "Christmas Face", all 40 seconds of it, was penned by Sebastian Krueger. Meanwhile, Christmas Unicorn sees Stevens reigning in his electronic touches and counterbalancing them with sometimes jazzy flourishes: "Up on the Housetop" even feels a little lounge-y and laid back, and could almost be played in a martini bar. Stevens even channels the ghost of pop past with his very John Lennon-esque "Happy Karma Christmas". There is the lack of a real showstopper on these discs, unlike Gloria, but that doesn’t mean that Stevens isn’t being ambitious: the aforementioned "Christmas Unicorn" reconfigures itself and morphs many times throughout its 12-and-a-half minutes. Despite its length and different movements, I suppose this is probably the song that may get picked up by carolers, as there’s a fun twist to the lyrics: "I’m a Christmas unicorn / In a uniform made of gold / With a billy goat beard / And a sorcerer’s shield / And mistletoe on my nose." All in all, Silver & Gold makes for a nice paring with Stevens’ previous Xmas box set collection Songs for Christmas. Put them both together and you get 100 songs total. That’s a lot of Christmas, to be sure, but it shows that Stevens -- whatever his emotions about the crassness of the season are -- is committed to being not just an interpreter of classic Yuletide carols, but a capable songsmith of the Christmas tune himself. Listening to Silver & Gold, you can’t help but wonder what will come in five or six years’ time, when Stevens, if he continues his usual pace, releases another set of Christmas material. Still, we’re here in 2012, and Silver & Gold is a great present unto itself, and there’s certainly enough here to make the Sufjan completest giddy with glee -- five EPs worth of one of the most brilliant, challenging and amorphous artists working in the biz today. Who knows if any of these originals will take hold and be cherished on the same level as a "Winter Wonderland" or "The Twelve Days of Christmas", but anyone interested in the music of Sufjan Stevens should be glad to have them -- no matter if he seems a little burned out on the whole commercialism of Christmas. We may not always get what we want for Christmas, and the same thing can be said for some of the material on this set, but it’s the thought that counts -- that Sufjan Stevens is still continuing on his tradition of recording at least one Christmas-themed EP every year. To that, all I have to say is that Silver & Gold, for all of its downcast sentiment behind it, proves that Advent is a time of birth. And that the beginning is near. And that you are going to live, perhaps not forever, but long enough. Happy Holidays, everyone.